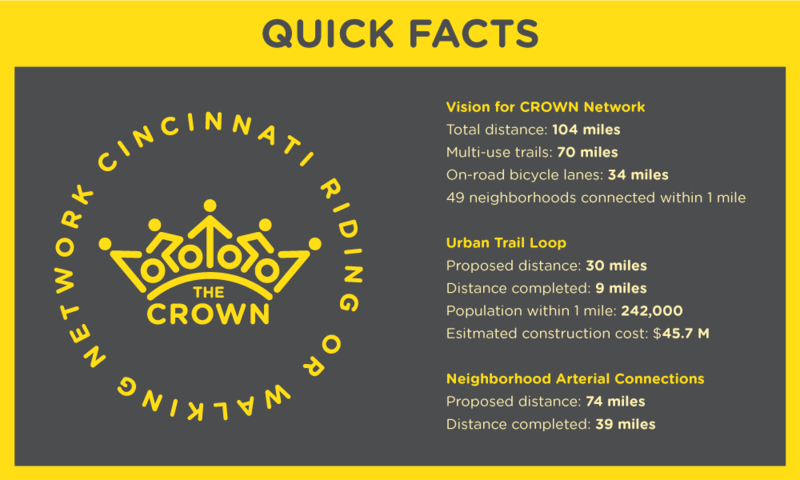 CROWN stands for the Cincinnati Riding Or Walking Network. 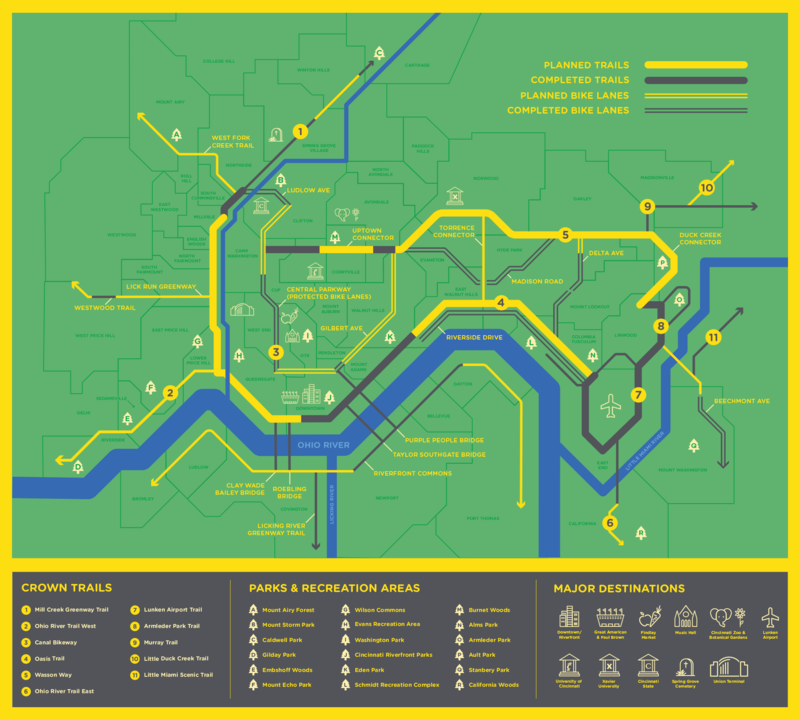 It's a vision for a 104 mile active transportation network connected by a 30 mile separated trail loop around Cincinnati's urban core. When complete, CROWN will connect at least 242,000 people in 49 neighborhoods to major destinations like employment centers, schools, parks, retail, recreation, and entertainment. CROWN will transform the way people move in Cincinnati. With CROWN, making the choice to walk or bike for transportation or recreation in Cincinnati will be easy, accessible, and convenient. Sign up for email alerts below to stay up to date and learn how you can help #CROWNcincinnati! At the heart of CROWN is a 30-mile trail loop that will link several trails that are currently in development by separate nonprofit organizations or government agencies. 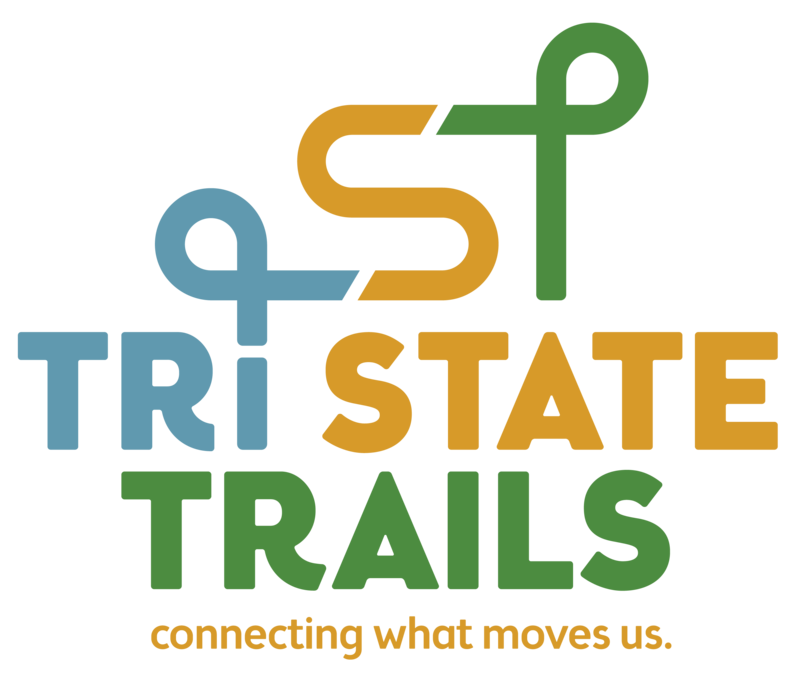 This unified vision links the existing Little Miami Scenic Trail, Ohio River Trail East, Mill Creek Greenway Trail, Lunken Airport Trail, and Otto Armleder Trail to the proposed Wasson Way, Oasis Trail, Ohio River Trail West, and Little Duck Creek Trail. 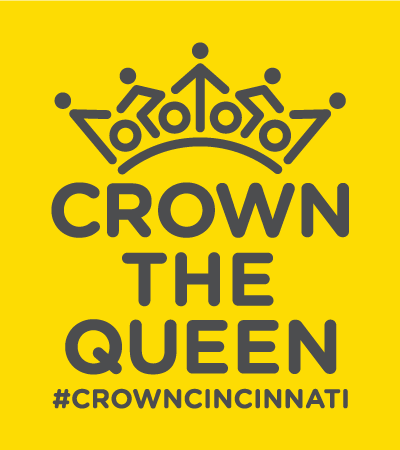 CROWN builds on the 2015 Cincinnati Connects Plan, which was funded by Interact for Health and managed/led by Groundwork Cincinnati Mill Creek. Click here to view a printable version of the CROWN brochure. Sign up for email updates to learn how to get involved. Select "CROWN Trail Updates" below.